What are Carrier Oils Exactly? It’s absolutely essential (pun intended) to use carrier oils with essential oils for massages and other procedures such as washing your hair, healing cuticles, and other things. Carrier oils are also known as base oils, including vegetable oils and those from fruit being Avocado and Coconut oil. Base oils dilute the essential oils known as absolutes before you apply to your skin. They are used to reduce burning and to slowdown the absorption rate for the oils to last longer on your skin. Some carrier oils used are Jojoba, Evening Primrose, Avocado, Apricot Kernel, Olive, Sweet Almond, Sesame Oil, and more. Carrier oils literally carry the 100% pure essential oils applied to the skin surface. Different carrier oils have dissimilar chemical properties, so determine the therapeutic benefit you are after and select oils accordingly. Essential oils will evaporate and have a stronger aroma. Carrier oils are most often cold-pressed vegetable/fruit oils from the fatty parts of the plants. Carrier oils do not evaporate or emit their aroma as intensely or pungently as do essential oils. Adding them together provides a scent along with soothing and health-giving results. Do not use baby oil that is made from mineral oil. These oils will not permit essential oils to go into your skin. There are a few basic ways to know how to blend carrier oils with essential oils for the most enjoyment and therapeutic benefits discussed below. You will be doing the mixing of vegetable or fruit carrier oils with your essential oils in no time. Note: Do not use carrier oils in your ultrasonic diffuser or nebulizer diffuser with essential oils. It will clog it and be too thick to come out. There’s no purpose for diffusing carrier oils anyway. To thin something with something else is to dilute it. With essential oils, we dilute them because they are potent and powerful applied directly to the body. So, we dilute the essential oils with carrier oils made of vegetables and/or fruits. You can easily be sensitized to essential oils right out of the bottle. Sensitization is burning, redness, itching, rashes, and maybe hives that will always be the same with that specific oil. It’s not difficult to add a drop of essential oil to a teaspoon of your favorite carrier oil, is it? That’s about all there is to it. Essential oils don’t usually bond; they are simple mixtures. Essential oils do not mix with water; oils float on top. Different amounts of essential oils will change the mixture with a carrier oil. The health benefits will differ as well. Equal amounts of essential oils can be added to carrier oils in any order that will not affect the blend or fragrance. There is no one carrier oil better than another. They are all different in their properties and chemical composition with different viscosities such as thick or thin. The thicker carrier oils are best for normal and dry skin. The fatty acids in the carrier oils are not made by the human body, yet the skin needs it. Easy memory trick to dilute essential oils for skin video. The oils are extracted from the fatty parts of the plant’s kernels or fruits using cold pressing. They are rubbed onto the skin and enter the blood stream for wellbeing. They are not toxic and do not evaporate. They will become rancid after about a year. They help spread your essential oils over the skin easily. Recipes will tell you the amounts of each product you will need. They are easy to do in little time. Dilution rates for adults are usually 2%. Be aware that for children and elders, the rates will change due to their sensitive skin at about half the rate as adults. For adults, if you want a small massage blend of 1-ounce of carrier oil, you would add 12 drops of essential oil, lotions unscented, or body vegetable butters. 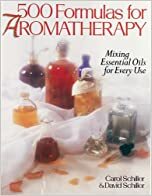 A good book to help you on your journey is 500 Formulas for Aromatherapy: Mixing Essential Oils for Every Use on Amazon.com. Facial Masks—1 tablespoon of your favorite carrier oil with 3 tablespoons of any good clay mask. Body Massage—5 drops of your beloved essential oil for each tablespoon of your preferred carrier oil. For your face massaging, use 2 to 3 drops of essential oil for each teaspoon of carrier oil. Bathing—10 drops of essential oils mixed with a teaspoon of neutral lotion, honey, milk, or bath salts. Blend well in a bowl or cup and add to your full bathtub of water, mixing with your hand. This is only a common way to mix and it is contingent upon your recipes and the skin of the person using the blend. Carrier oils must always be 100% pure virgin cold-pressed vegetable oil that has not been refined. This is the best type for the base oil to be added to 100% pure essential oils. For a wonderful aromatherapy massage, you will want a lighter oil for your face and a thicker oil for your entire body. Shop for carrier oils that are single rather than blends of two or more oils. Grocery stores, department stores, and pharmacies usually don’t sell cold-pressed oils, rather those using heat. Carrier oils on Amazon.com are a good place to shop for the best products from reputable companies. carrier oil is naturally moisturizing and is nourishing and healthy for skin. It will never clog pores and the skin absorbs it to be softer. The light-yellow 100% pure Sweet Almond carrier oil has very little fragrance and resists going rancid being excellent for a soothing massage. Low in linoleic acid, it has unsaturated fatty acids and can be used all over the body. It is also high in vitamins E and A to nurture your skin. It is made from pressed almonds and this oil has been used for centuries by the ancient cultures. All almond trees are GMO. This oil is great on your face after you’ve just washed it. Put 2 drops in your palms and gently rub on your face. It is wonderful on baby and kid’s bodies too. It is expeller-pressed and hexane-free. It comes in a plastic bottle, not glass. Note: Do not use Almond if you have nut allergies. Sweet Almond Oil and skin benefits video. Grapeseed carrier oil is a naturally scented base oil that is light and good for oily skin. It is easy absorbed by the pores of the skin. Grapeseed oil is a good alternative to Olive oil sold in grocery stores for salads and cooking. Cooking oil is not the same product as the essential oils base oil also known as carrier oils. This brand comes with a dispensing pump in a plastic bottle. It’s for external use only. Test it on your inside elbow to see if you have any allergic reactions such as redness, rash, or hives. Do not put this oil near your eyes and keep away from kids. If you are pregnant or breast feeding, consult with your doctor before using. The tiny seeds in grapes are full of powerful antioxidants and natural plant elements known as oligomeric proanthocyanidin complexes. They are known to be anti-inflammatory, anti-carcinogenic, antiviral, and antibacterial. Blend with essential oils for a body massage and use in your hair for a beautiful appearance. The 100% pure and natural grape seeds are from Chile and are expeller-pressed with no parabens, chemicals, or artificial colors. How to start using grapeseed oil for hair video. Avocado carrier oil is superb for sensitive and mature skin. Rub onto your cuticles to soften them or make a blend using your essential oils. It is a golden/green color. The RMO™ brand Avocado is unrefined, extra virgin, and cold-pressed from Mexico or Spain. The scent is a nutty warm flavor and the oil is thick in consistency. Add 2 drops of essential oil to a teaspoon of carrier oil and rub all over your body. Being thick, it is slower to absorb into your skin and leaves a slight oily residue on the skin. Keep in a cool dark place to have for 1- to 2-years. 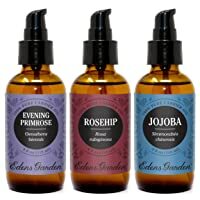 Edens Garden offers 3 oils that are wonderful carrier oils in a 3-in-1 package. Evening Primrose carrier oil is grounding and balancing for homeostasis the physiological internal stability for normal functioning. The harmony of being is useful for women to sooth and refresh. It is good for mature skin for wellness holistically. Rosehip carrier oil is a dynamo for your skin with its fatty acids for regenerating. Rosehips, those round red berries on rose bushes in the fall have quite a bit of alpha-linoleic and linoleic acids for soothing all types of skin. Jojoba carrier oil will stop dry itchy or greasy skin. It will resist dandruff, dry skin, acne, and wrinkles. With many antioxidants, this carrier oil will diminish the look of pores and lessen dark sun spots. Mix with any essential oil for a heavenly body massage. Moringa Seed carrier oil has high amounts of behenic acid that is used in massage oils, lotions, hair care products, and soap. It is anti-inflammatory and anti-aging and will last up to 5-years sitting in a cool dark place. This too can be used with your favorite essential oils for a body rub. Moringa seed is the most exotic and highly sought after of all the world’s many oils. This oil is cold-pressed and undiluted with no added ingredients. It has been tested for purity with every batch and safe for all skin types. Benefits of Moringa Oil video. There are many carrier oils available on Amazon that I could write a book about, and maybe I will one day. Note: The FDA (Food and Drug Administration) has not approved nor is involved in evaluating the products discussed here. None of the products are meant to prevent disease, cure ailments or disease, or cure problems. Holistic people use essential oils, aromatherapists, and lovers of essential oils and those who want a measure of relief and comfort from common conditions not necessarily requiring a doctor. I hope this article has been helpful for you using carrier oils with essential oils. Carrier oils are necessary since pure essential oils cannot be applied directly to your skin. The scent of carrier oils is very light compared to essential oils and will work well for your aromatherapy experience.